The time for pleasantries has passed. The everyone-across-the-nation-is-interesting window is rapidly closing. Tomorrow begins November, which means we’re focusing on conference-title chases, playoff-spot pursuit and the occasional season-defining rivalry game. With that in mind, Ryan Tipps, Pat Coleman and I zoom in the focus from all 244 teams to the games (besides the one you’re already interested in) that most deserve your attention. Last week, teams lit up the scoreboard; we’ll tell you who won’t do it again. We’ve got insight on which top 25 teams are in danger, where conference races will tilt and which teams to keep on your radar, just in case something unexpected happens on Saturday. You’ll be able to say you saw it coming. Keith’s take: No. 1 UW-Whitewater at No. 16 UW-Platteville. The Warhawks didn’t partake in the scoring of the 70s like so many top-10 teams did last week. But they’ve been putting up silly numbers by preventing them. Since Franklin scored 13 on UW-W back in Week 2, just 17 points have been scored on that defense. Only UW-Eau Claire’s 19-play field goal drive came in the first three quarters, with the game still in reach. The Warhawks have the nation’s best scoring defense, and the Pioneers are 11th, at 11.3 points per game. UW-Whitewater’s push starts up front, where defensive linemen Mykaell Bratchett and Zach Franz are getting help from sophomores Brandon Tamsett and John Flood. Linebackers Jacob Zilbar and Andrew Belken need to have big days for the Pioneers’ defense. Offensively, QB Bryce Corrigan the UW-Platteville score 31.6 points per game, which in this era of high offense is just 73rd in the country. 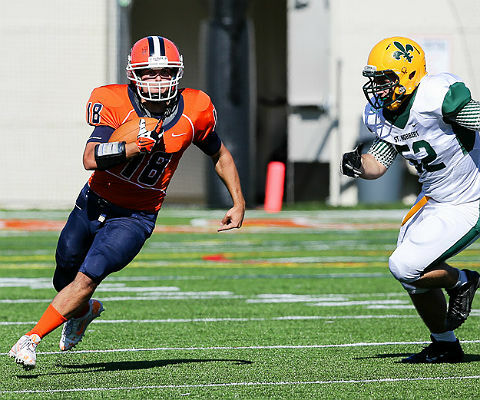 Ryan’s take: Carroll at Macalester. Yup, I’m going off the top-25 grid here because at this point in the season, so much of the focus is on winning conferences and getting into the playoffs. This is one of those decisive games. Both of these teams are undefeated in the North Division of the MWC, and the winner should be able to round out the regular season with confidence and get a shot at the divisional championship game on Nov. 15 – and then a spot in the postseason. Pat’s take: Howard Payne at Louisiana College. There have been so many entertaining games in this conference this season that I feel like I have to elevate one of them to Game of the Week status. Louisiana College has only been held under 30 points by Alcorn State and two top-five teams, while Howard Payne had a classic 54-53 win at East Texas Baptist two weeks ago. If you like defense, though, watch Keith’s Game of the Week instead. Keith’s take: Hardin-Simmons at No. 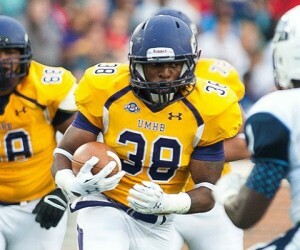 2 Mary Hardin-Baylor. The Cowboys are surprisingly 5-1 and effectively 6-1, since they led Southwestern 28-7 in the third quarter in Week 1 before “persistent lightning” led to the game being called a no contest. The Cowboys’ only loss, however, came on their home field to Texas Lutheran the following week, 37-14, which explains why they aren’t getting any love in the poll. UMHB beat TLU 72-16 last week, so why would I pick this to be surprisingly close? Well for one, it only needs to be within 56 points to fit the definition, given the UMHB > TLU > HSU hierarchy to date. But it’s also because the Cowboys have a decent defense, and allow just 3.5 yards per carry. It’s not quite the 1.98 yards that UMHB allows, but given the history between the two Hardins, a reasonable final in the 35-14 range is possible. Ryan’s take: LaGrange at Christopher Newport. These teams are almost at opposite ends of the conference standings, but the Panthers are coming off a season-defining win against Huntingdon, so they’ll arrive in Newport News with some momentum. CNU certainly won’t let this game slide by, though, as the race for the USA South’s automatic qualifier could realistically go to any one of three teams right now. There’s a good deal at stake, and the Captains surely wouldn’t mind representing the conference in the postseason after missing it in 2013. Pat’s take: St. Lawrence at WPI. First of all, surprisingly distant for an East Region conference, where it’s nearly a six-hour drive. But also, looking for a fairly close game on the scoreboard in this one as well, especially for a game between a 3-4 team and a 6-1 team. St. Lawrence is built around defense, so I expect the score to be low, and close. Even though this game is perfectly positioned to be a trap game for St. Lawrence, right before the big showdown with Hobart, I also expect the score to be comfortably in SLU’s favor. Keith’s take: No. 18 Concordia-Moorhead. Having nominated St. Thomas as a potential upsetter (sure, that’s a word) of Bethel last week, I’m doubling down. But almost as much as it’s hard to believe the Tommies would pick up their third loss in a season for the first time since coach Glenn Caruso’s first there, in 2008, this is about the Cobbers. Concordia-Moorhead hasn’t been to the playoffs since 2005, but it’s been 8-2 the past two years, with an October loss to Bethel and an early-November loss to St. Thomas each time (they’ve actually lost six straight to the Tommies). The Cobbers, as you might guess, are 7-1 with a 27-17 Oct. 4 loss to Bethel the only blemish so far. It’s time for QB Griffin Neal, DE Nate Adams and the Cobbers to get the Tommie off their backs. Ryan’s take: No. 20 UW-Stevens Point. As was pointed out in the ATN Podcast earlier this week, UW-Oshkosh’s record is deceiving because the first three opponents were non-D-III schools. The Titans are coming off of playing Whitewater closer than anyone else this season, and despite UW-SP’s marquee win over North Central early in the year, most of their games haven’t been blowouts. Just like with the game against Platteville, it’s possible that the talent of the WIAC will continue catch up with the Pointers this week. Pat’s take: No. 20 UW-Stevens Point. I have to concur with my colleague here, rather than try to pick another one, and Ryan’s reasoning is sound. Part of the reason why Oshkosh was so “successful” against Whitewater, holding them under 100 yards in the second half, is because Jake Kumerow got banged up early in the game and they went really vanilla after that. So I think the Oshkosh score is misleading. However, UWSP simply can’t give the ball away as many times as it has and if the Pointers do that on Saturday, the Titans will make them pay for it. Pinpoint a game that will change a conference-title chase. Keith’s take: MIT at Endicott. The Gulls get 6-0 MIT at home this week, and face Western New England (6-1 after last week’s 35-34 loss at MIT) next week. One of these three teams is representing the NEFC in the playoffs, and fans of other Eastern teams should get behind Endicott. While the Gulls challenged themselves and lost to MASCAC leader Framingham State and LL leader Hobart in their first two games, a 9-0 MIT team would have to be a candidate to host in Round 1, provided it is eligible. Endicott leads the conference in scoring defense at 19.9 points allowed, and the Engineers lead it in scoring at 41.7 points per game, so there’s your matchup to watch. Ryan’s take: Wheaton at Elmhurst. There will be no letdown for the Thunder after last weekend’s thrilling Little Brass Bell victory. Elmhurst has hung in the conference race – barely at times – and has gone 4-0 so far, but a future as a 5-2 CCIW team seems likely for the Bluejays. After Saturday, Wheaton should be all alone at the top. Pat’s take: Centre at Hendrix. We had lots of talk about Hendrix in the first few weeks and then they dropped off the radar for a little while. But No. 1 quarterback Seth Peters is back after he missed the Wash. U. and Berry games (both losses) because of injury. Top running back Dayton Winn is back after missing the Berry game as well. Hendrix is very much in the SAA race and controls its own destiny. Which team put up huge numbers last week that it won’t duplicate this week? Keith’s take: Stevenson. I’m kind of mad at myself for writing this question. Because the longer I looked, the more I found teams that are probably going to put up big numbers again. I can’t trust Buena Vista’s defense to slow No. 6 Wartburg, or Wooster to stifle DePauw after a 59-point week, or Salve Regina to stop Maine Maritime’s running game. Stevenson, however, whitewashed FDU-Florham, 57-0, last week. Trey Lee scored three of his four touchdowns by halftime, when the Mustangs led by 37. This week the opponent is No. 12 Widener, which is also No. 12 nationally in total defense. The Mustangs scored eight touchdowns last week. The Pride has only allowed eight touchdowns all season. Ryan’s take: Linfield. The Wildcats didn’t reach the 70-plus mark that other top-10 teams did in Week 8, but that’s certainly not an indictment on the talent the team has. This week pick isn’t an indictment, either. Willamette is more than five-scores better than Linfield’s opponent from last week, and I don’t expect the Linfield to play into a particularly drastic margin this week. Still, Linfield can probably hang 40-something on the Bearcats and win comfortably. Pat’s take: Thomas More. The Saints have been back on cruise control the past three weeks after W&J caused them to downshift out of the tie for first in the PAC and the Top 25. They will not be putting up a 42-3/49.7/64-7 score against Waynesburg, to be sure, and they might not even put up a winning score. The Empire 8 and ODAC are the toughest conferences to predict, but pick a winner from one anyway. Keith’s take: Brockport State. Trying to figure out who’ll win when the Golden Eagles get a visit from Ithaca using past occurrences is an exercise in mental torture. (Hey, it is Halloween). Both teams are 5-2 and hoping to catch St. John Fisher in the Empire 8 race. One of the Bombers’ losses is to Frostburg State, which Brockport beat 46-0. But the Golden Eagles lost to Utica, which Ithaca handled, 27-10. The Bombers defense limited Salisbury’s often-outstanding triple-option rushing attack to just 74 yards in a 32-7 win last week. If we were going by just that, I’d say Bombers win easily. But Brockport counters with an offense that’s had 42 plays of 20 yards or longer this season, 11 in the past two games (h/t Brockport Sports Information). But even with those, three of the Golden Eagles’ wins are by five points or fewer. And in the nothing-makes-sense world of the E8 this season, one can only assume the result that seems more likely — Ithaca riding its dominant win over Salisbury to another win — is the opposite of what will happen. Ryan’s take: St. John Fisher. The Cardinals will be going up against Buffalo State in what should be a competitive game between teams that have shown flashes of greatness this season. Fisher is four points away from being an undefeated team, and if I had to make a pick, I’d get behind Fisher to snag the E8’s automatic qualifier. But the Bengals will certainly have some fire in them, and pulling out the upset against the No. 15 team in the nation would put them right back in the mix for the postseason. Pat’s take: Guilford. Thanks for leaving me an easy one. My alma mater has a really young team this year and just isn’t that good right now, and just in case one might be tempted to think they could still knock off Guilford, I’ll point out that it’s homecoming in Greensboro and that Catholic beat the Quakers last season, so it’s unlikely they’ll get taken lightly. Only question is if it will be close to the 62-14 win that Hampden-Sydney got at Catholic? Will Guilford go for style points to try to get itself more Top 25 votes? Keith’s take: Ursinus. We’d be talking about the big showdown of undefeated teams with Johns Hopkins if not for the Bears’ 38-10 puzzler against Juniata a few weeks back. They had a momentum-killing turnover right before the half in the game, and settled for a field goal coming out of the half on a 12-play drive. Everyone’s entitled to a bad day, and the Bears can forget about theirs if they play their best game against the No. 9-ranked Blue Jays. Pat’s take: Christopher Newport. The Captains are still one of the one-loss teams afloat at the top of the USA South standings, while LaGrange and Air Raid Junior have struggled on offense the past four weeks (and on defense for three of those). The Panthers offense, expected to be prolific, has been ordinary, averaging 22 points the past four weeks. CNU has two games left and has its destiny in its own hands. Whether there is a separation at the top of the poll, whether it’s the top four teams, the top six or seven, or some other combination, one thing is for sure: they certainly separated themselves on the scoreboard this week. Does that mean this is a bad year for parity? Or a great year for the upcoming playoffs? Keith and Pat discuss that and much more in this week’s Around the Nation Podcast. Plus they hand out their game balls, look at teams on the rise, under-the-radar highlights, key stats and more. It’s that time of year when the air gets colder, the crowds get rowdier and the games get more meaningful. To boil the action among 244 D-III teams down to a best-of list, Ryan Tipps, Pat Coleman and I sorted through dozens of games, including three clashes between top 25 teams. It’s also not too early to start discussing playoff implications, and we highlight teams that will give themselves a boost this weekend, and those that will fall down a peg. And not to forget the teams outside the playoff chase, we highlight a few teams in the midst of rough seasons that fans can look to for a W on Saturday. It’s late October. This season is just getting to the good part. Here are our picks for this week. Keith’s take: No. 2 Mary Hardin-Baylor at Texas Lutheran. We hear this all the time: “You guys don’t give us any respect.” “No love for my team in the top 25?” Here’s the thing: Respect is earned, not given. That’s the difference right now between the two 6-0 teams in Texas, but what a giant opportunity this is for Texas Lutheran, which was 0-10 before coach Danny Padron was hired in 2010 following a highly successful run coaching in high school. UMHB is one of the five most successful programs in D-III over the past 10 or 15 years, and this year’s squad is well worth its No. 2 ranking. Both teams come in top 5 nationally in scoring offense, averaging more than 49 points per game. Defense is where the separation is; UMHB allows 11.5 points per game, TLU 26.3. That puts the spotlight on a Bulldogs defense led by DBs Drake Dowling and Michael Wall, although seniors Adam McGuire, Joey Meza and Ethan Powell have a chance to leave a mark. The crazy thing is TLU doesn’t even have to win to earn respect, move up in the top 25 or preserve its playoff hopes. They’re in front of their home crowd, and UMHB is expected to win, and maybe win big. It’s an opportunity. Ryan’s take: No. 12 North Central at No. 19 Wheaton. In the ATN Podcast this past week, there was some talk about how Wheaton has dispelled some of its early-season hiccups and shown that it truly is a Top 25 team. Sorry Thunder fans, but I’m not yet convinced. The conference slate so far has consisted of the bottom three CCIW teams, and two of the nonconference opponents currently have a combined record of 1-11. That means two things: 1) I don’t know that Wheaton is ready to face a North Central team that became battle-tested in nonconference play (though the Cardinals’ CCIW games have also been against a weak slate); and 2) a loss here by Wheaton, coupled with that nonconference schedule, could mean that the team lacks the strength of schedule to be a real Pool C contender. For North Central, a loss Saturday would be its second of the year, also creating a gray area on the Pool C front. Perhaps the playoffs are in the back of these players’ minds – or perhaps just the fact that it’s the Little Brass Bell rivalry game is motivation enough. Pat’s take: No. 2 Mary Hardin-Baylor at Texas Lutheran. Sorry, I have to repeat Keith’s pick here because it’s just a game that can swing a lot of things: UMHB’s hopes at a top seed, Texas Lutheran’s playoff hopes (and perhaps the hopes of others) as well as rankings for both of them. Texas Lutheran has been through a few changes recently: leaving the ASC for the SCAC, leaving a local high school stadium for a more intimate stadium of its own on campus … oh, and it’s started winning more games. TLU has a lot of former Mary Hardin-Baylor players and coaches on its sidelines as well, in case anyone needs any extra motivation. Keith’s take: Berry at Birmingham Southern. A few seasons ago, B-SC started 5-0 for the second consecutive year and was a legitimate playoff contender, while Berry football didn’t exist. If you’re a fan of a conference that never crosses paths with these teams, now part of the SAA, you might be surprised to learn that they both come into Saturday’s matchup with two wins. The Vikings have won two out of three, their first wins in history, and are trending upward offensively. B-SC is 2-1 in the SAA but allows 30.4 points per game. The more established program might still win, but Berry should make it interesting. Ryan’s take: Washington U. at Chicago. These teams are having very different kinds of seasons, but Wash U. has found its groove at times this year, even if the team’s record doesn’t necessarily reflect that fact. If the Bears can muster up one of their better games, they’ll be able to hang with Chicago. Pat’s take: East Texas Baptist at Louisiana College. I think this is a great game waiting to happen. I already expected it to be close, but I really want to spotlight it here. I expect a classic game of the “Little 12” type we’ve been talking about on the podcast the past couple of years. One of many exciting games as we’ve come to expect from the American Southwest Conference. Keith’s take: No. 11 Bethel. The category is “most likely,” not “definitely will be.” A loss to No. 22 St. Thomas wouldn’t be a major upset either, but we’ve sort of forgotten the once-dominant Tommies since a late-September loss to St. John’s. With the Royals allowing 15 points per game and the Tommies 16.5, expect a slugfest that could go either way, have major impact on the MIAC race and possibly result in an upset. Ryan’s take: No. 16 Widener. It wouldn’t be an earth-shattering upset if Lycoming wins this one, but it will be telling to learn what the Warriors did with their bye week after losing to Delaware Valley on Oct. 11, a loss that knocked them out of the Top 25. A win for Widener, however, would give a lot of credibility to the Pride’s success this season. Pat’s take: No. 13 UW-Platteville. Again, not overly likely but I can only say “none” once or twice a season, even if this has been a season in which none’s the word. The Stout team I saw a couple weeks ago has more than a fighting chance in this game, and for Platteville, this game comes sandwiched in between contests vs. UW-Stevens Point and UW-Whitewater. Which team revives its conference title and/or playoff hopes? Keith’s take: Endicott. Because the Gulls opened up with non-conference losses to 2013 playoff teams Framingham State (20-17) and Hobart (28-18), it’s been easy to view the NEFC race as Western New England vs. MIT. But after winning at Coast Guard on Saturday, Endicott players on the bus ride back from Connecticut can refresh the scoreboard for updates on the the Golden Bears-Engineers 5 p.m. Saturday clash in Cambridge. When one loses, the Gulls will know whether to circle next week’s home MIT game or the one at WNEU in two weeks as their chance to take control of the NEFC. Ryan’s take: Albion. Lycoming, which I talked about in my answer to the previous question, would definitely fit this category, but Triple Take is best when it uses the spread. In the MIAA, Albion is traveling to current conference leader Trine. Both teams are coming off of losses from last Saturday, but only Albion’s was to another MIAA team. A win here won’t put the Britons in the driver’s seat for the conference title, but it will give them a big lift toward that goal. The game should be competitive, but I like that Albion has cut its teeth against some solid competition without getting blown out (the most notable of which is the 42-31 outing against UW-Stevens Point). That should translate well on the field against Trine on Saturday. Pat’s take: Ithaca. The Bombers are going to need more than a little help, but if they beat Salisbury on Saturday they’ll have knocked off one of the one-loss teams ahead of them. They have yet to play St. John Fisher and they’ll need help from someone remaining on Buffalo State’s schedule to take down the Bengals. But as I alluded to in the podcast earlier this week, Butterfield Stadium is the place where the triple-option goes to die. Never get turf, Ithaca. Which team can forget about the playoffs after Saturday? Keith’s take: Lycoming. The Warriors need a home win against Widener or they might be looking at an ECAC bowl invite while the Pride and Aggies play for an NCAA spot in Week 11. A win puts them right back in the MAC race, which as a 5-0 team before a 52-42 loss to Del Val two weeks ago, is probably where they feel they belong. The Warriors had only allowed 50 points total before their last game, but Widener, in a strange twist, is a also a defensive juggernaut (No. 4 nationally in scoring defense) under new coach Mike Kelly. Widener also has one turnover all season. The Pride has four road wins already, which should reduce the effect of having to travel to Williamsport, and Lycoming is the team that can’t afford to stumble again. Ryan’s take: Castleton State. The Spartans are going up against Husson, the only team who has a perfect record in conference play so far. I expect Husson to keep it that way. Week after week, the Eagles, who are 4-1 overall, have been more convincing than are the Spartans. Castleton State could have position itself for a postseason opportunity with a win here, but the teams just appear to be going in different directions. Pat’s take: The University of Chicago. Chicago has the better record, by a significant margin, but Washington U. has played a much tougher schedule and will definitely come in prepared. This is a rivalry game, to boot, and kicks off the University Athletic Association portion of the teams’s schedules. But the Maroons cannot afford to take another loss. Which team won’t be playing for any titles this season, but will win by 10 points or more? Keith’s take: UW-River Falls. The Falcons have shot themselves in the foot more than any team in the country this season, with a national-worst 25 turnovers (12 fumbles, 13 interceptions). But they face the least-prolific offense in the nation in UW-Eau Claire (three touchdowns and three field goals in six games). Considering the UW-RF defense has held St. John’s, UW-Stevens Point and UW-Platteville below 30, it shouldn’t take a career day to outscore the Blugolds. But it would help if they hang on to the darn ball. Ryan’s take: DePauw. The Tigers picked up conference loss No. 2 last weekend, effectively knocking them out of any playoff or title discussions. But as any fan of rivalries knows, seasons can be salvaged by that Week 11 game. 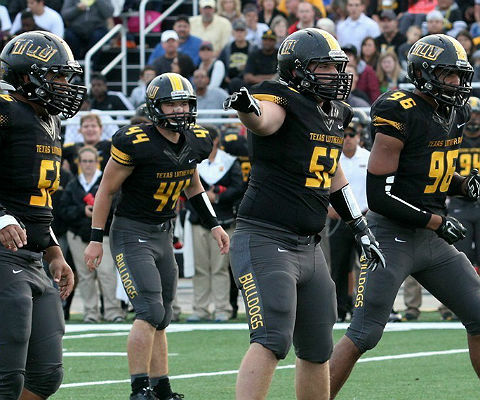 But before then, there’s still a lot of football to play, and I see nothing slowing a DePauw team when it lines up against floundering Allegheny this weekend. The Gators have lost by more than 10 in each of their defeats this season, so it seems likely that DePauw will be able to use Allegheny as a way to take out some frustrations. Pat’s take: Heidelberg. Perhaps an obvious choice, but a week after the Berg pulled Cartel Brooks from the game after eight carries vs. Mount Union, they’ll be looking to get him as many carries and yards as possible against Marietta. 10 points or much much more. Keith’s take: Centre. Neck and neck with Carroll, also 6-0, for least-talked-about undefeated team, the Kentucky Colonels get a visit from 5-1 Rhodes this week. Two of the more alliterative and efficient quarterbacks in D-III face off in Centre’s Heath Haden and Rhodes’ Blake Box. But the big-picture interest here is how each team needs to beat the other for a notch on its playoff resume, and how Centre’s continued success could affect Pool B, which also features unbeaten Wesley and Texas Lutheran and 5-1 Framingham State, whose only loss is to Rowan. Ryan’s take: Salisbury. The E8 is notoriously hard to get a handle on, and Salisbury’s performances have a big role to play in that. Mix a big loss to Wesley and a close loss to Buffalo State with wins over St. John Fisher and Utica, and we now have a team that might be climbing out of the hole it dug for itself early in the season. No team is spotless in the conference, meaning Salisbury has a real shot to claw into the postseason if it can extend its three-game win streak. Pat’s take: Macalester. The Scots are likely to improve to 6-1 this week as they host Lawrence. They aren’t going to win by 60-plus points like Carroll did last week because Mac isn’t trying to impress anyone, but they should win and set up the showdown next week with Carroll for the lead in the Midwest Conference North Division.